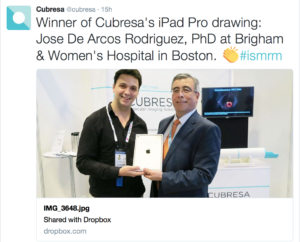 ISMRM 24th Annual Meeting & Exposition | Cubresa Inc. Thank you for visiting us in Booth 519 at the Suntec Convention & Exhibition Centre in Singapore, May 7 to 13, 2016 where we introduced our NuPET™ in-bore PET scanner for existing pre-clinical MRI systems. See our media release on the release of NuPET. Visitors to our booth were entered into a raffle for an Apple® iPad Pro™ 9.7-inch tablet for participating in a short survey. 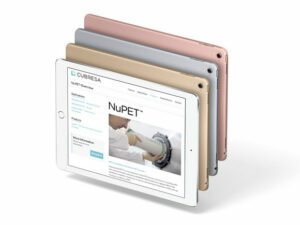 The winner, who needed to be present in the Cubresa booth to accept the iPad, was announced on Wednesday, May 11 at 3:45 pm. UPDATE: Congratulations to Jose De Arcos Rodriguez, Ph.D., of the Brigham & Womens Hospital in Boston, who won the iPad Pro at our drawing in the ISMRM booth!